I love to end the year with a plate full of spaghetti. It gives me the kind of comfort that pasta masters to perfection. 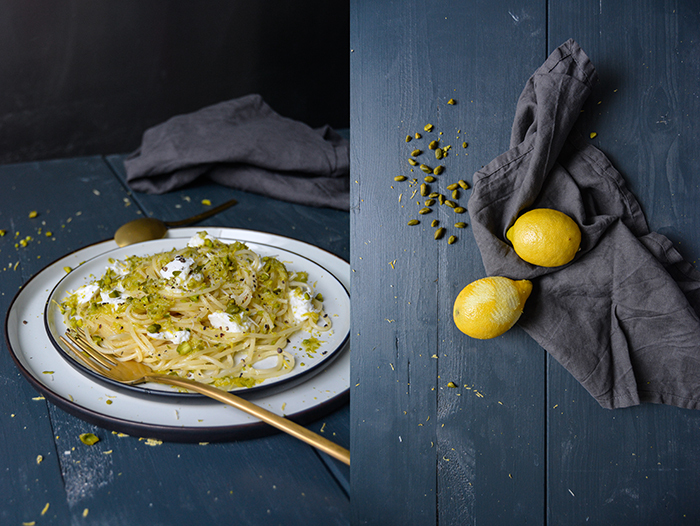 Its beauty and magic lies in simplicity – and in many happy carbs. This year’s combination is tangy, a bit creamy, and nutty – it makes me feel good and that’s all I need. 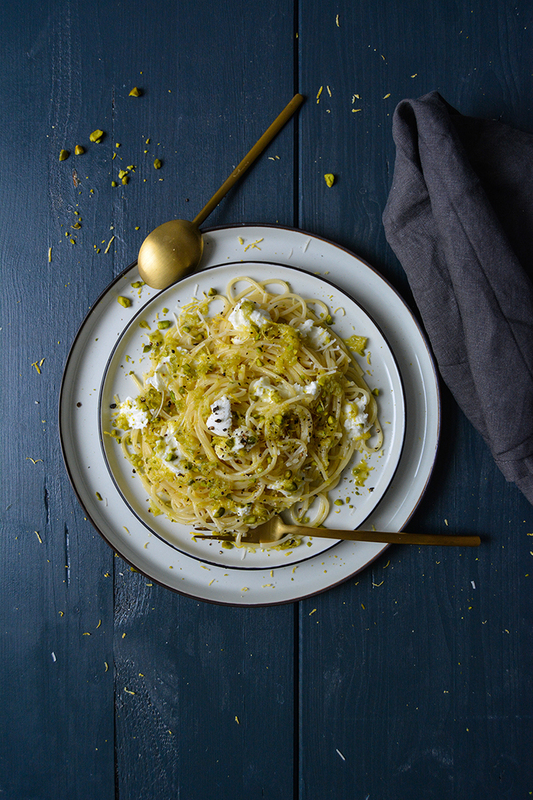 So here’s my Mediterranean creation to celebrate the changeover from 2016 to 2017: spaghetti with lemon pistachio pesto and mozzarella di Bufala. In the past 12 months of this turbulent year I felt my limits quite often and I flew higher than I thought I could ever fly without burning my wings. I saw my first cookbook being born, being celebrated during my book tour in Berlin, London, Malta, New York, and Washington. 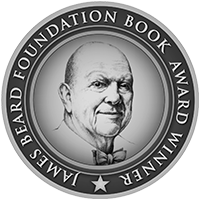 I saw the Eat In My Kitchen book reaching the New York Times’ list of ‘The Best Cookbooks of Fall 2016’, which I still can’t really believe. So much love and support came into my life, so much happiness has been spread through this book that feels like a baby to me. There were unbelievable highs, so many wonderful moments, moments that I will feel thankful for for the rest of my life. But there were also lows and losses that tore trenches into my heart that will hurt for the rest of my life. I lost a person who’s been so close to me that I sometimes can’t even say who’s me and who’s him. He was my mentor, my supporter, my biggest critic, my challenger. He was my friend, my most beloved Swabian, and my step father. I wouldn’t be who I am without him, and I’ll never again be who I was before he left this world. Eat In My Kitchen wouldn’t be what it is without him. I want to thank all of you for supporting me and my book, for being there and for coming back to these pages here on the blog. Eat In My Kitchen makes me grow every day, this blog makes me go back to my kitchen and experiment more than I would do if I didn’t write about it. Thank you for being on this journey together with me. Have a peaceful and joyful start into the New Year! In a large pot filled with salted water, cook the pasta until al dente. Drain and stir in a little splash of olive oil. 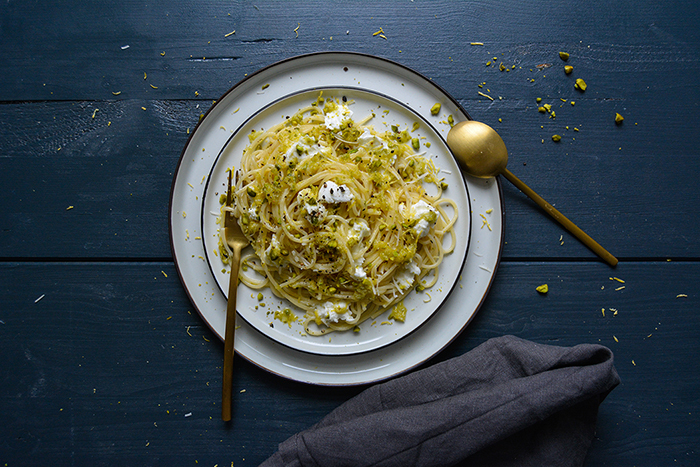 For the pesto, in a medium bowl, whisk together the lemon zest, Parmesan, pistachios, and olive oil and use the back of a spoon to press the Parmesan into the oil until well combined. Season to taste with salt. 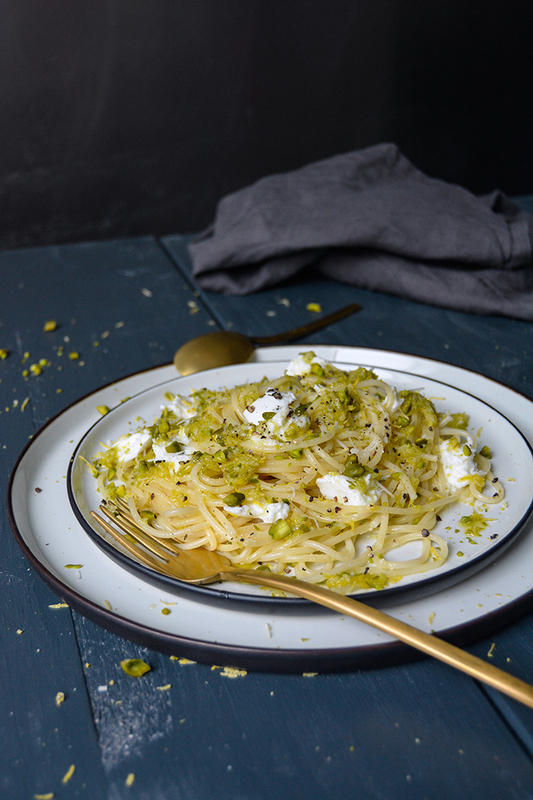 Divide the spaghetti and mozzarella di Bufala between plates. 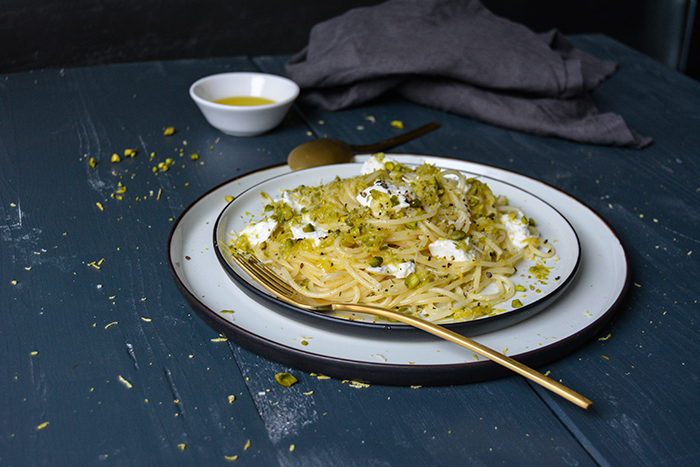 Sprinkle with pesto, additional lemon zest, Parmesan, and pistachios. 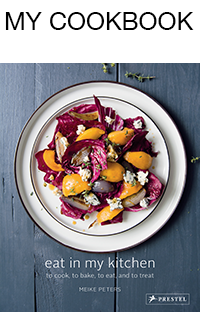 Season to taste with flaky sea salt and crushed peppercorns, serve immediately. Meike, this was SOO delicious. Thank you for this marvelous recipe. I thoroughly enjoy following your blog. Keep up the spirit. Happy new year. PS: I ordered three copies of your book today. Thank you, Sabine! Happy New Year and all the best for 2017! !